Struck-by hazards can cause the most brutal and disastrous accidents in the construction industry and within facilities, warehouses, or factories worldwide. According to the New York Post, by September of this year, there had already been close to 50 injuries to construction workers caused by falling debris. 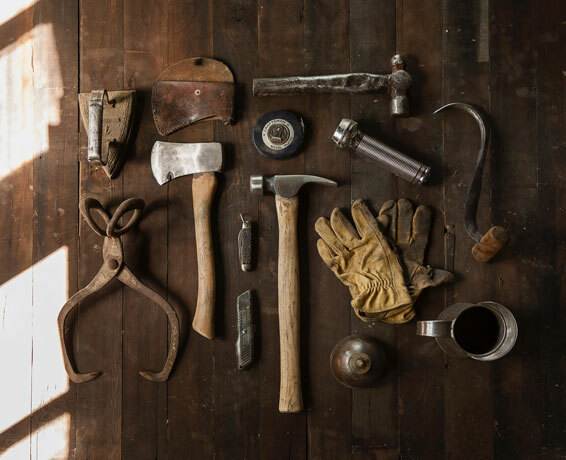 Debris can include materials, tools, or machinery, but any object falling from a height could cause serious injury or death, and unfortunately, the hazard is not specific to workers. Civilians near or around the site are at risk as well. Debris related accidents can be prevented with debris netting which must be correctly installed and providing full coverage to be most effective. It is most commonly seen vertically but can also be used horizontally for perimeter protection. You can enhance the horizontal application by adding fall safety netting, which will not only catch debris but people as well. Struck-by hazards within a facility, unfortunately, are not in short supply. When walking into an industrial environment, you will most likely see machines of all kinds. There are multiple OSHA enforced standards involving these machines that are designed to protect employees or operators, and when followed correctly, they are effective. However, that’s not always the case. A robotic arm could suddenly engage while being repaired, an individual could be distracted and walk di- rectly into the path of an approaching forklift, or a machine could malfunction causing a catastrophe no one saw coming. 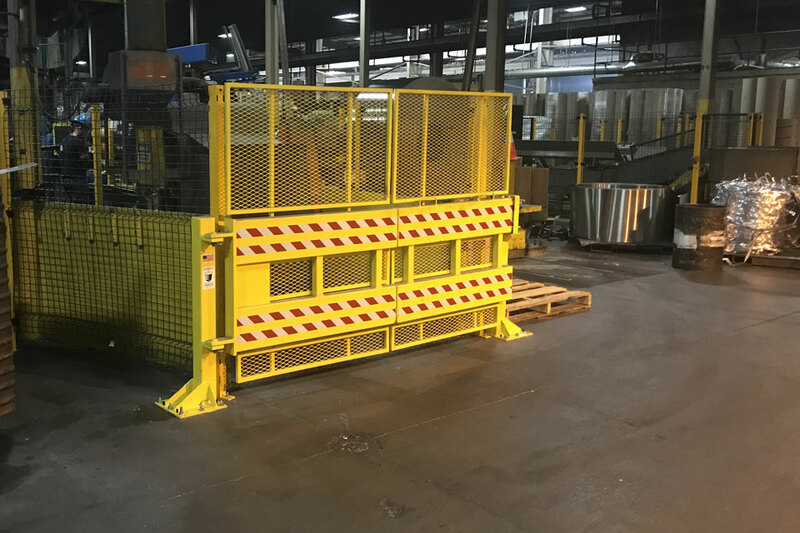 Pictured above is a custom solution we provided Golden Aluminum, Inc. to guard their equipment. These gates feature our exclusive Crawl Guard attachment which adds an additional barrier above and below the main rails of the gates, preventing any unauthorized access. Our Defender Gates and Nets can be used anywhere in your facility and for many purposes. They can guard machines, prevent access to restricted areas, stop falls, or indicate a danger zone. Our Gates and the Post Mounted Defender Net, also known as the Post Mounted Loading Dock Safety Net, are each capable of stopping a forklift which is one of the most common hazards found in facilities, warehouses, retail stockrooms, or any environment where material needs to be moved. Whether it be driving a forklift or working around them, after a while, we get a little too comfortable, and our awareness of the dangers present begins to subside. We may not be as alert throughout our daily activities, and that’s when accidents happen. 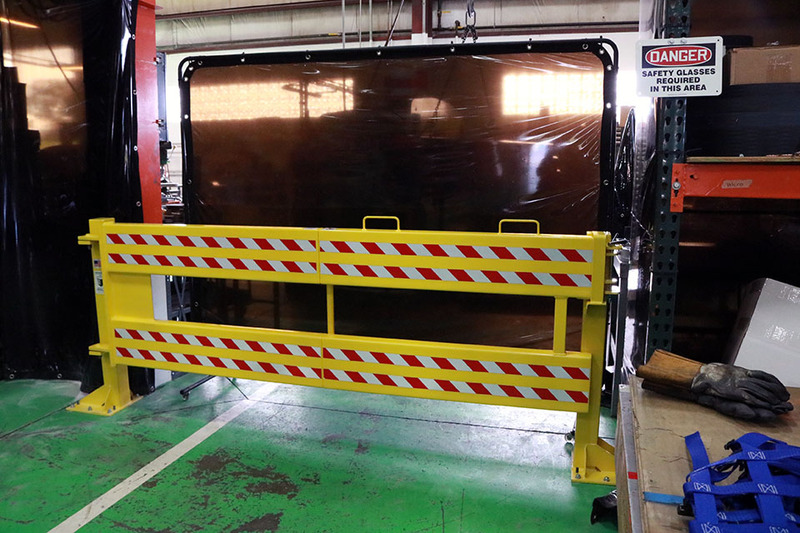 Installing safety barriers, such as our Defender Gates or Defender Nets in and around areas frequented by forklifts could help protect your employees and remind them that the area is unsafe. They must always be aware of their surroundings, especially when a forklift is actively being used to complete daily tasks, like loading and unloading racks. Racks may not reach altitudes found on construction sites, but objects falling from them can be just as dangerous. Every facility will have products and materials unique to them, but it is their responsibility to make sure those items stay put and fortunately, keeping them shelved is quite simple. You can purchase our pallet rack netting by the roll and fasten with zip ties, order one of our rack safety net kits which includes brackets, cables, cable-ties, and hooks specific to the size ordered, or purchase fixed width panel kits which will arrive with eye bolts, cable, net, hooks, and installation hardware. These products will protect your employees and inventory and keep operations running smoothly. The above hazards are fairly easy to spot and plan for, but it’s important to prepare for unlikely scenarios as well. We have created several custom solutions to combat the unpredictable. When a customer needed a way to stop shrapnel from making contact with personnel and equipment in case of an explosion, we built them custom Kevlar reinforced nets. 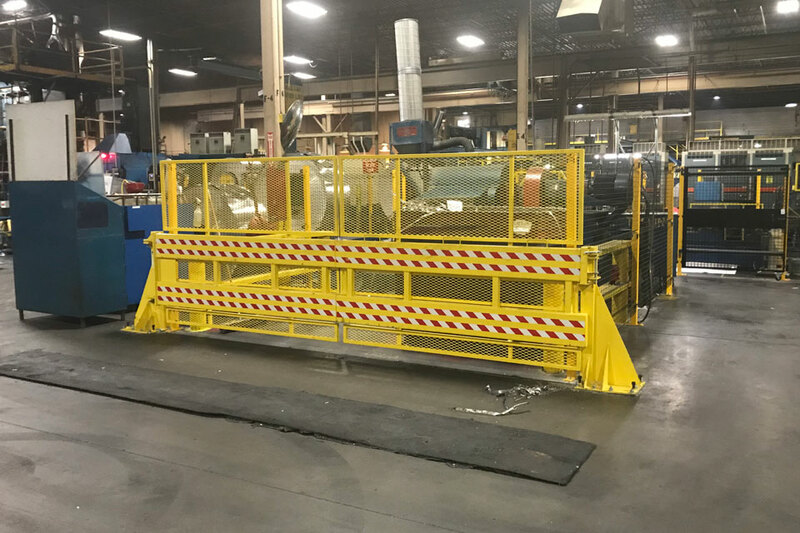 Another customer, a logging facility, needed a way to prevent logs from crushing employees as they traveled through a series of machinery. 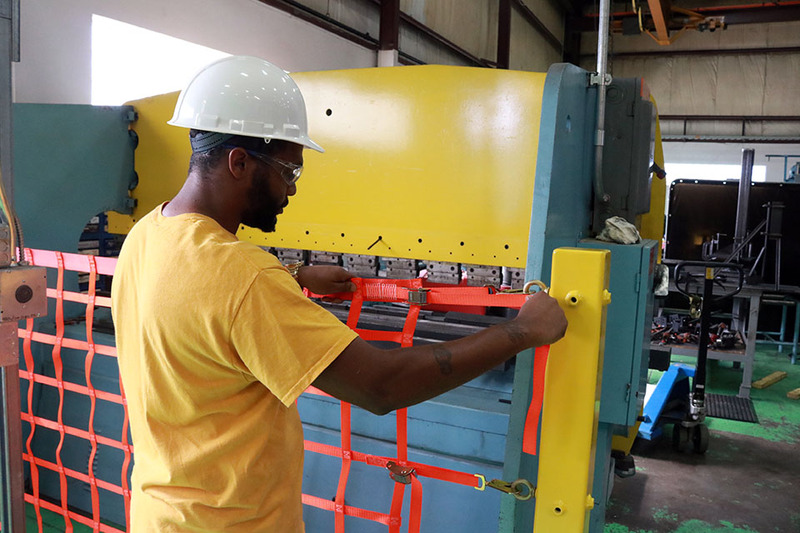 Their custom solution was a 3-inch mesh safety barrier net meant to act as a personnel safety barrier, protecting employees in case of emergency. 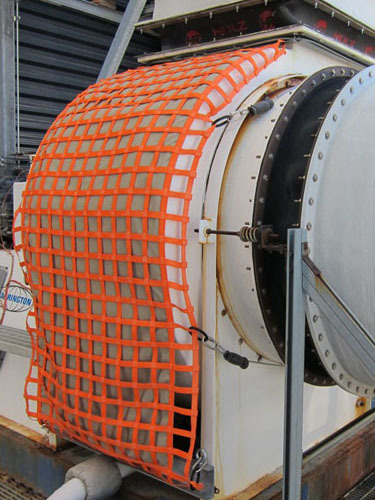 NASA needed a custom net to act as a safety barrier for their Marshall Space Flight Center. We built them a 40ft. by 40ft. 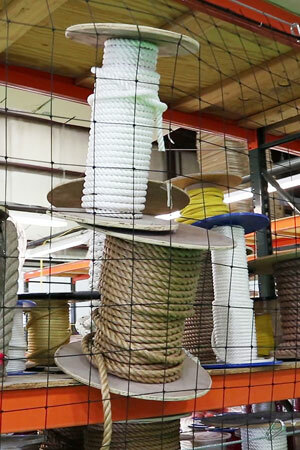 custom rope safety barrier net, each strand capable of holding 1,200lbs. All of these solutions are designed to keep personnel and the rest of the facility safe in worst case scenarios. Struck-by hazards can come from any direction and cause serious injuries including death. Not all accidents are completely preventable, but most are, and we can help you keep your site or facility safe.